2018 marks the fifth year of the annual Global Family Office Report from Camden Wealth, this time produced in association with UBS. The report reflects a record number of 311 family offices from around the world participating in the research this year. Aligned with the rise in participants, the value of the data and insights for benchmarking and planning purposes increases markedly. There has been a notable jump in the number of new family offices being established after the millennium, one-third of all family offices responding now have secondary branches, successfully expanding their global footprint. 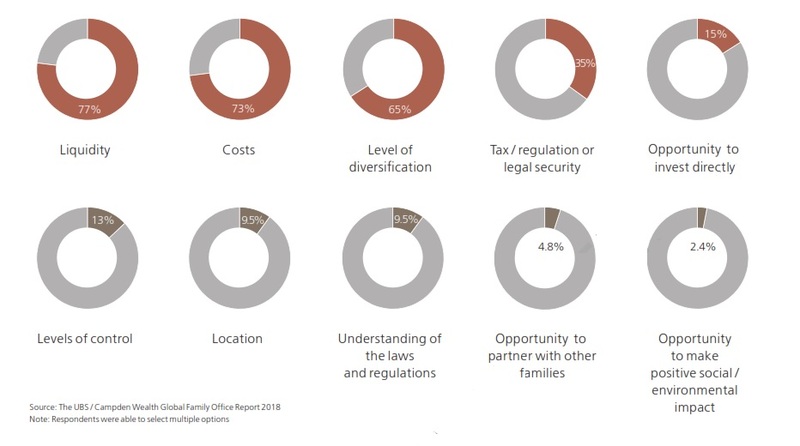 Half of family offices report that their assets under management (AUM) have increased over the year, while three-quarters remarked that the wealth of the families they serve has been on the rise. But, what is probably the most remarkable point to highlight this year, is the fact that family offices’ total average investment portfolio return reached 15.5% in 2017. This is up from 7.0% in 2016 and a complete revival from 0.3% in 2015. It is in this context that this extract looks at Family office investment in hedge funds. Hedge funds remained in lower demand through 2018, driven by their under-performance stemming from the low volatility regime in recent years. This has seen private equity and equities investments outperform hedge funds and maintain their higher allocations in family office portfolios. Allocations to hedge funds have been falling since at least 2015, with this year being witness to a 3.2 percentage point decline. Hedge funds now again account for just 5.7% of the average family office portfolio. The less-than-desirable returns of hedge funds over the past several years have discouraged investors from allocating a greater proportion of wealth to this asset class. Taking a closer look, long/ short strategies account for the highest proportion of hedge fund investments, followed by global macro, credit and event-driven. 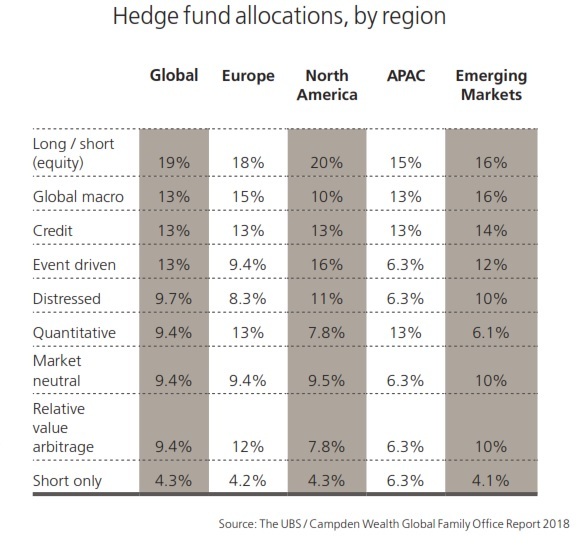 Family offices in North America are the most likely to take a long/ short (equity) or event-driven approach, whereas those in Europe tend to favour global macro or relative value arbitrage positions. From the table below it can be seen that expectations from family offices of returns for hedge funds have declined over the last five years. But the return versus expectations is also a factor in investor perception of the asset class. Why keep the allocations when returns have not met even lowered expectations? So the expected return of hedge funds was 5.5% in the 2107 survey of family offices, compared to the benchmark return of 6.0% (by the HFRXGL index) last year. This was the first year in three that returns had not disappointed expectations. And the legacy of “disappointing returns” has been a decline in allocations to hedge funds by family offices. 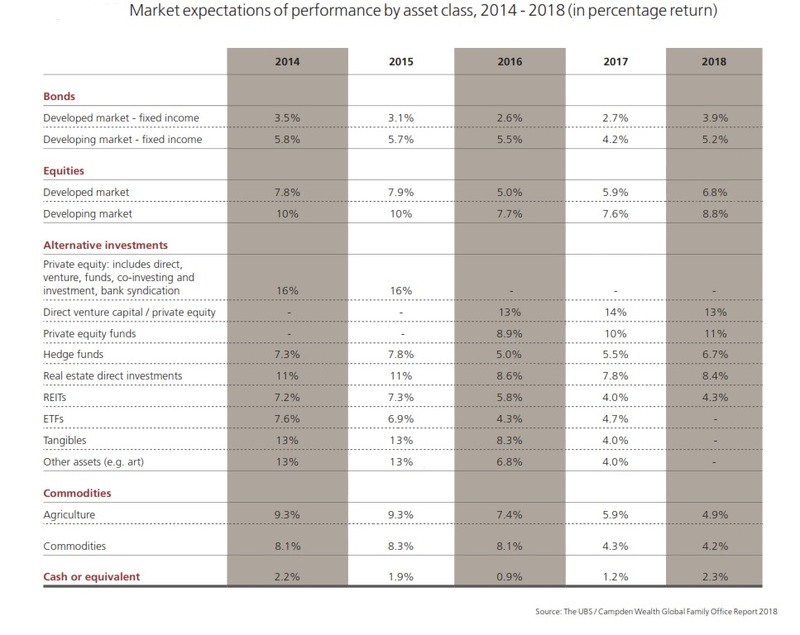 Across nearly all asset classes invested in by family offices hedge funds produced amongst the lowest return in 2017 compared to the expected return, That is the, coming into 2018 family offices were better pleased with the returns from other asset classes versus expectations than those from hedge funds. The reasons beyond returns for investing in hedge funds were enquired of in the survey, and are shown in the graphic below. It is noteworthy that by inference family offices at this point see hedge funds as offering reasonable liquidity, cost and diversification. 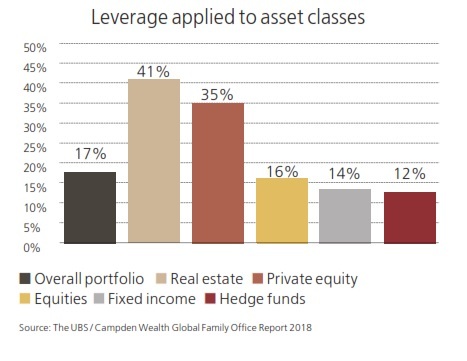 Family offices leveraged their hedge fund holdings less than other asset classes (graphic below) this year. Leverage applied should be a function of the distribution of returns as well as the availability of lending capacity at an economic price. Downside risk, the size and frequency of losses, has to be a consideration as well as the size and repetition of gains. In this regard the transparency of hedge funds versus other asset classes does not help. Real estate and private equity are not as readily, frequently or accurately marked-to-market as hedge funds, so psychologically they are easier to leverage. With three months to go in the year, it is unlikely that hedge funds will produce double-digit or even high single-digit returns this year (HFRI was up 1.32% at the end of July). However expectations of family office investors in hedge funds are now much lower than previously, to the extent that it is now feasible that the erosion of capital allocations to hedge funds will pause in 2018/19.